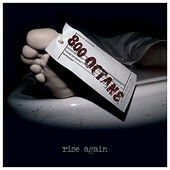 800 Octane is a long-running Northwestern punk rock troupe whose fourth full-length release finds the quartet in fine form. Playing the kind of hard-edged punk rock that bands like Black Train Jack, H2O, and Face to Face employ, the 13-track Rise Again combines gritty guitars on "Bloodline" with melodic choruses like "Apology to You", creating a bouncy yet hard-hitting listening experience. 800 Octane pump out high energy, contagious anthems that, while both wistful and poignant, pack the kind of punch that only seasoned veterans can muster.